Hot-headed fire wizard Natsu and his team of high-powered pals are back! 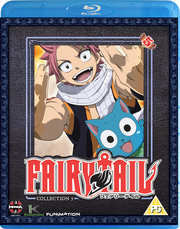 Harnessing the forces of dragon fire, ice, weaponry, and the zodiac, four young wizards from the infamous magical guild Fairy Tail team up. In season two the friends unite with other guilds to take on one of the darkest guilds in the wizarding world! Contains episodes 49-60.